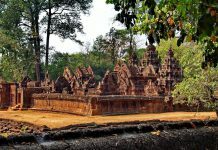 Prasat Phnom Krom is a 9th century Angkorian temple on top of a 140m high hilltop in Siem Reap, Cambodia. 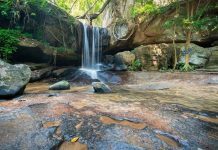 Phnom Krom is a hill located about 12 kilometers southwest of Siem Reap, and is home to a spectacular Angkorian temple built in the 9th century, called Prasat Phnom Krom. The hill is also the best spot to catch the sunset in the Siem Reap area, which can be enjoyed from a beautiful pagoda at the top of the 140-meter-high hilltop. 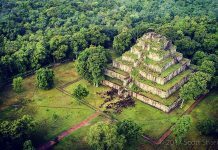 The Angkorian temple that towers atop Phnom Krom is a Hindu temple originally built in the 9th century, during the reign of King Yasovarman. The temple has three towers, each dedicated to a Hindu god. The southern tower is dedicated to Brahma, the central tower to Shiva, and the northern to Vishnu. 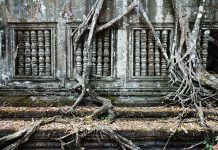 Eleven hundred years of erosion have significantly weathered the temples. This isn’t surprising considering the building material is sandstone, and the hilltop temples are subject to the constant winds blowing off of nearby Tonle Sap Lake. Unfortunately, this means many of the carvings and detailed designs have been lost forever. 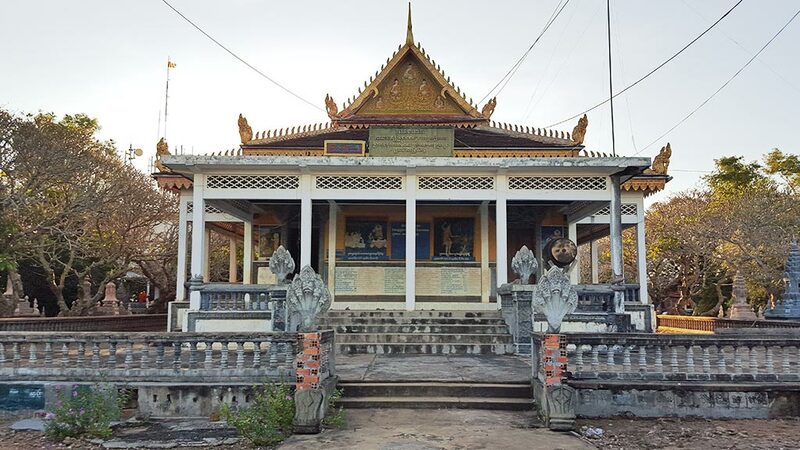 Phnom Krom is actually one of three hilltop temples built during King Yasovarman’s reign in the region. The other two are Phnom Bakheng and Phnom Bok. 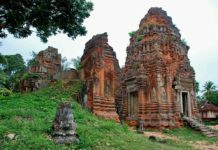 Phnom Krom is located only 10 kilometers south of the Siem Reap city center. Like most destinations in and around Siem Reap, the most efficient way to travel is by tuk-tuk. Consult with your hotel to obtain a trusted driver, and negotiate around $10 USD roundtrip. Make sure to specify that the rate you agree on includes the return trip. The drive itself is stunning, with villages, rice fields, and lotus fields to admire. There are plenty of local restaurants along the way, serving delicious and authentic Cambodian fare. Most restaurants have hammocks to relax in after the meal and listen to the peaceful village sounds. When you arrive at the base of the mountain, if arriving by bicycle or tuk-tuk, be sure to take a tour around it. With few tourists, you’ll have the opportunity to visit a small Cambodian village and really feel like you’re off the beaten path. If the season is right, you’ll find a field of lotus flowers. 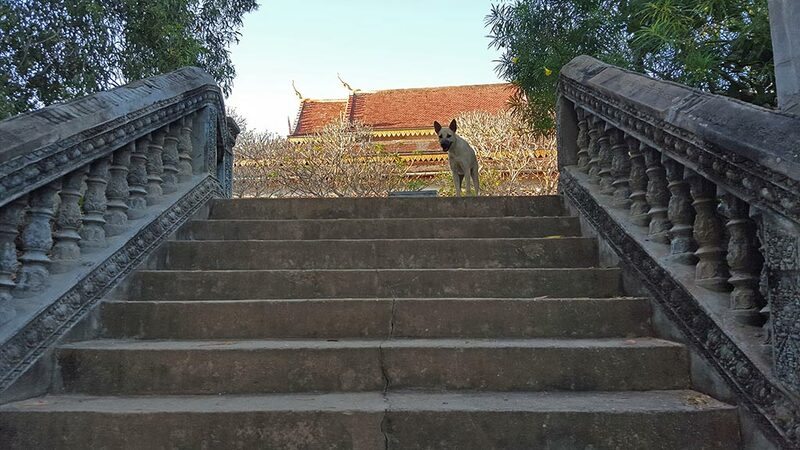 When you arrive at Phnom Krom, you’ll first need to ascend a long flight of stairs, after which you’ll come to a paved road. This road will lead to the top of the hill and to the temples. Stairs leading to Phnom Krom’s hilltop. You’ll need to show your Angkor Pass at the checkpoint located after the staircase. This is about the halfway point to the top. On the walk up, take time to look around at the natural beauty of the area. If you’re lucky, you may see some goats grazing alongside the path. When you arrive at the top, you’ll first see the pagoda. The temple ruins lie at the top of another set of stairs from here. A modern pagoda on top of Phnom krom Mountain. There are many locations to watch the sunset in the Siem Reap and Angkor Wat area, and all are beautiful. 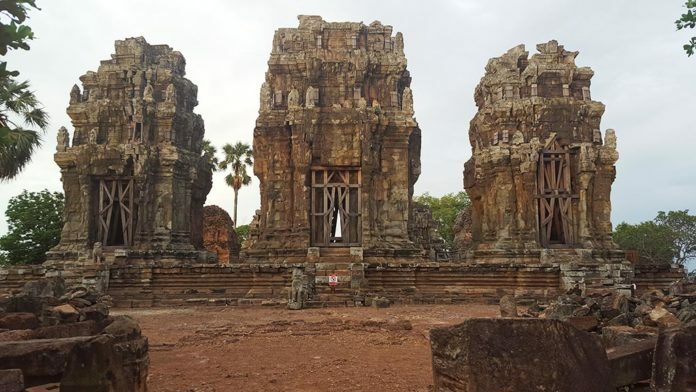 However, Phnom Krom is by far the best spot because of the great views of the Siem Reap countryside, the reflections of the sun off of the waters of Tonle Sap, the few tourists there to disturb the experience, and the peaceful sounds of nature. On Phnom Krom, the best spot to view the sunset is behind the temple ruins on the southwest corner. The following video captures the sunset from Phnom Krom very well.